From the Bamboo collection by Gucci, these sleek sterling silver stud earrings are ideal for adding a touch of glamour to any outfit. Eye-catching without stealing the spotlight, these dainty accessories will never go out of style. 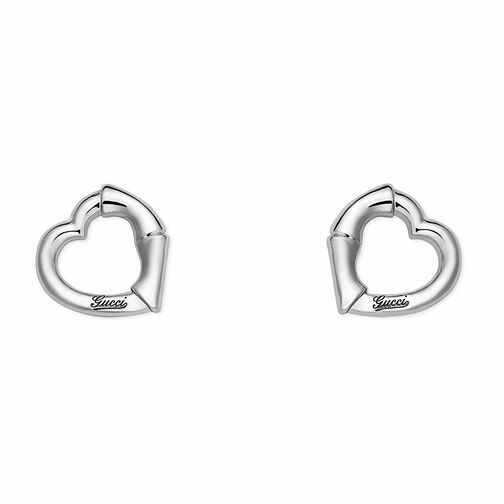 Gucci Sterling Silver bamboo heart studs is rated 4.5 out of 5 by 2. Rated 5 out of 5 by Anonymous from Gucci Bamboo earrings Purchased item for my partner. After comparing these to other makes they felt well made and give a look of quality. My partner loves them. If your looking for earrings with a bit of weight then these are a must to have a look at. These have not tarnished unlike other good highstreet brands which my partner has found To discolour in the past. We would recommend these are worth a look.